Correct oxygen training is a concern in most hospitals across the UK, and more guidance is needed to correctly administer in hospitals, report finds. Oxygen is one of the most commonly used drugs in emergency medicine and before publication of the first British Thoracic Society guideline in 2008, emergency departments and ambulance services gave oxygen to almost all breathless or seriously ill patients. The 2015 British Thoracic Society (BTS) Emergency Oxygen Audit Report found that one in seven of the 55,000 patients in UK hospitals at the time of the audit received oxygen therapy for their condition. Of these, four in ten were receiving oxygen without a prescription or written order. Correct training in oxygen provision has also been a concern as more than half of hospitals do not provide sufficient training for doctors and nurses in oxygen provision and monitoring. Oxygen has often been thought of as a treatment for breathlessness, when in fact it is for hypoxaemia. In non-hypoxaemic patients, oxygen has not been shown to have any consistent effect on the sensation of breathlessness. In some vulnerable patients, such as those with chronic obstructive pulmonary disease, too much oxygen may be harmful as it can lead to increased carbon dioxide levels. The under- and overuse of oxygen has led to occasional deaths, according to the BTS. However, the 2015 BTS audit did reveal that 85% of hospitals in the UK had implemented an oxygen policy, 100% used pulsed oximeters to measure a patient’s oxygen levels on all nursing observation rounds, and 72% recorded the patient’s oxygen levels in a dedicated section on the monitoring chart, consistent with BTS guidelines. 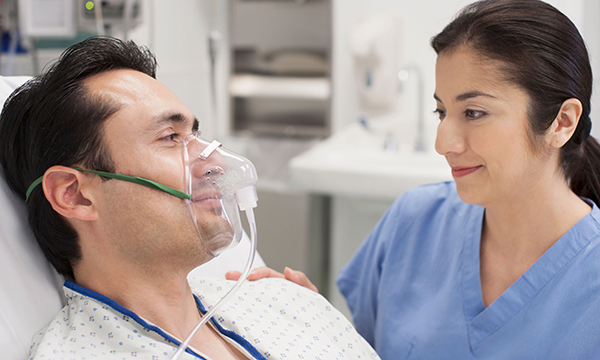 The BTS has released an updated guideline on oxygen use in adults in healthcare and emergency settings. The society is encouraging healthcare professionals across the NHS and beyond to adopt the latest version. The update is based on new evidence that details the role of effective prescribing and delivery of emergency oxygen in improving health and saving lives. Endorsed by more than 20 organisations, including the RCN, the guide advises that a target range of oxygen in the blood should be prescribed for all hospital patients at the time of admission and written on their drug chart. Document when oxygen has been started and the flow. Ensure the target rate is achieved quickly. Titrate to keep in range. Sign the drug chart every drug round. Monitor at least every four hours. Record target saturation range and wean off oxygen if the patient is clinically stable. Complete and initial the observation chart. ‘Oxygen is an important drug and should always be prescribed and monitored like any other medication. It is beneficial to many patients, but can be harmful if misused. We urge nurses to adopt the updated BTS guideline so emergency oxygen is always used in an optimal and safe way. ‘The core of the updated guideline remains the principle of targeted oxygen therapy, with a target range of 94-98% for most patients and a target range of 88-92% for those at risk of hypercapnia. There is compelling new evidence of harm from giving too much oxygen. Updated guidance from the British Throacic Society on oxygen use in adults.